Basketball has a long, rich history dating back to the late 19th century when the hoop was first invented. The equipment used to play the sport, including the ball and hoop, has evolved from a crude basket to a technologically advanced rim built for durability and performance. Dr. James Naismith, the inventor of basketball, was born in 1861. He grew up in Ontario, Canada, and later attended McGill University in Montreal. Naismith moved to Massachusetts in 1891 to work at the YMCA Training School in Springfield, where he invented the sport. The first basketball hoops were peach baskets nailed to an elevated track. The peach basket hoop was replaced by a metal rim and netting about a decade after the sport was invented. The netting was closed at the bottom, so much like the peach basket, players had to climb up and retrieve the ball from the net each time someone scored. However, by 1906, the bottom of the net was cut out to allow the ball to fall through the hoop. The first modern basketballs were made from pieces of leather stitched together with a rubber bladder inside. The American Basketball League, or ABL, was the first successful pro basketball league. It ran from 1925 to 1931. Modern-day basketball hoops were used during this time, including metal rims, nets and backboards. 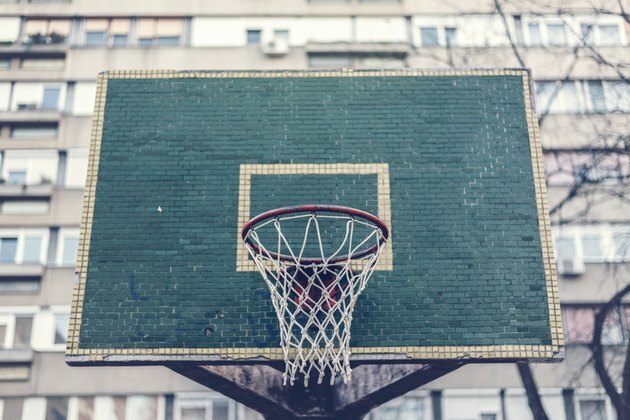 However, breakaway rims were not used, and the backboards were smaller than those used in the National Basketball Association, which began in 1948, when the National Basketball League combined with the Basketball Association of America. In 2011, the NBA rules state that the diameter of the basketball hoop must be 18 inches. This is measured from the inside of the ring. The net can be between 15 and 18 inches in length. The rim must be 10 feet from the floor. The backboard of the hoop may be either 6 feet wide by 3.5 feet tall, or 6 feet wide by 4 feet tall. Modern-day hoops also have a breakaway feature that allows the rim to flex when a player dunks the ball, reducing the odds of the rim getting bent or the backboard shattering.